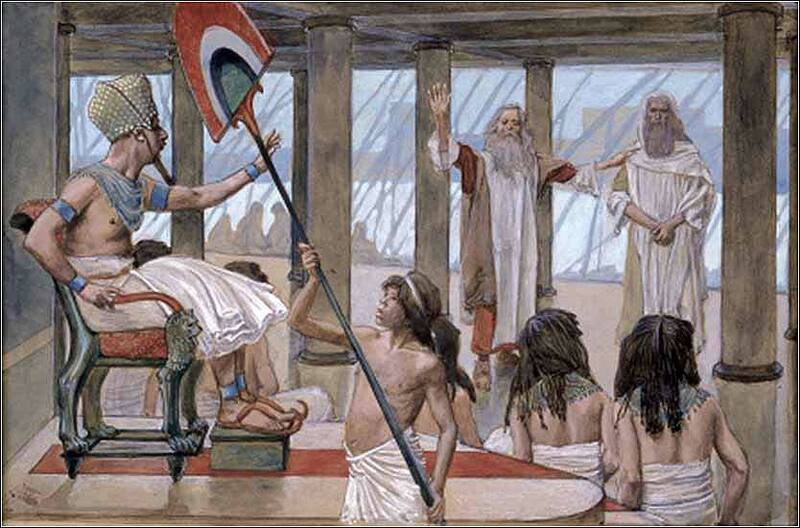 Moses Speaks to Pharaoh by James Tissot ca. 1896. Egyptology was highly popular in France in the late 19th Century, and Tissot attempts to recreate authentic Egyptian design. Moses and Aaron's rough and modest robes contrast starkly with the revealing and immensely stylized dress of Pharaoh and his servants. Note the lion throne. 426 people in our community are currently praying with you. So they took soot from the kiln and stood before Pharaoh. And Moses threw it in the air, and it became boils breaking out in sores on man and beast. And the magicians could not stand before Moses because of the boils, for the boils came upon the magicians and upon all the Egyptians. Both the tempo and the severity of the plagues are escalating. God now attacks the bodies of the Egyptians. The pain of the sores is shown by the magicians themselves, who "cannot stand before Moses. "The disease is not merely painful, but also disfiguring; those afflicted, who are all Egyptian, cannot disguise their powerlessness before the might of Jehovah. The role of the magicians is a gauge of the effect of the plagues on the people of Egypt. The roles of magicians, priests and physicians were closely tied and sometimes overlapping. 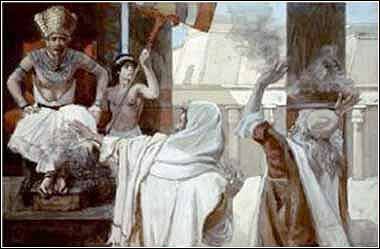 Initially, they were able to recreate the plagues (at least to a degree) and show that they and their gods were as powerful as the God of the Hebrews. But as of the fourth plague (gnats), they fell so far behind that they could not even imitate it. They had been defeated and admitted that the plague was "the finger of God" and not a magic trick. Now, they cannot even stand before Moses. The magicians are so thoroughly defeated that they have become irrelevant. They are not mentioned again in Exodus. Pharaoh stands alone, against the opinions of his advisors. Another difference here is that Moses does not give Pharaoh any warning. Perhaps in light of Pharaoh's repeated lies and broken promises, God has simply begun to punish him. No specific demand is recorded, no promise evoked. The plagues of Egypt have become a plain demonstration of the destructive power of human pride, running contrary to the will of God. Plague of Boils by James Tissot ca. 1896. Pharoah gapes in astonishment as Aaron throws soot into the air.